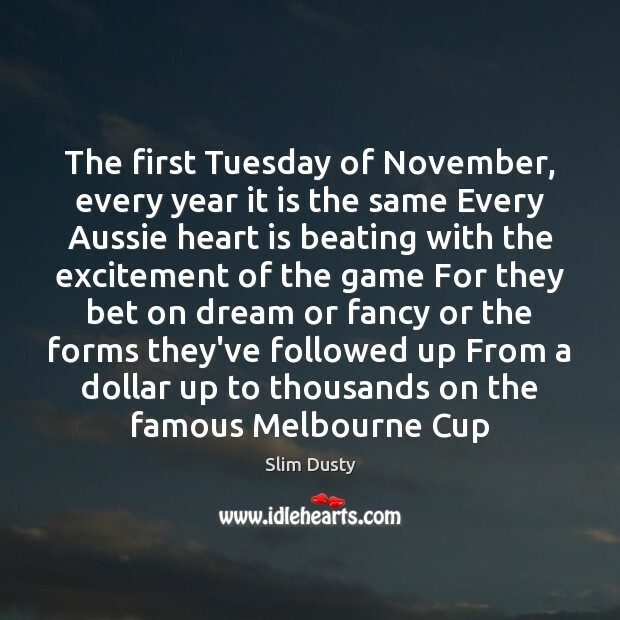 Quotations about Aussies. Quotes to stimulate mind and drive action! Use the words and quote images to feed your brain inspiring things daily! I don't know if Wimbledon's seen anything like it. I don't know if they will again. But it was just - it was electric. 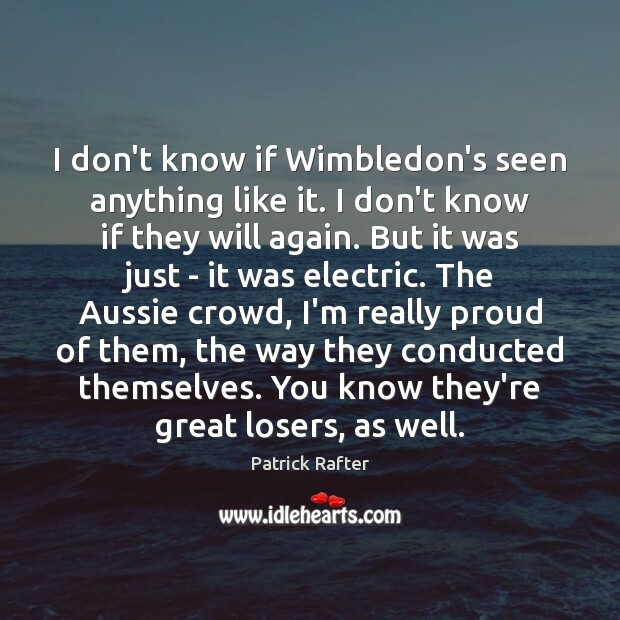 The Aussie crowd, I'm really proud of them, the way they conducted themselves. You know they're great losers, as well. I have spent too long training myself to speak with an American accent, it's ingrained. I spend 16 hours a day on set speaking with an American accent. 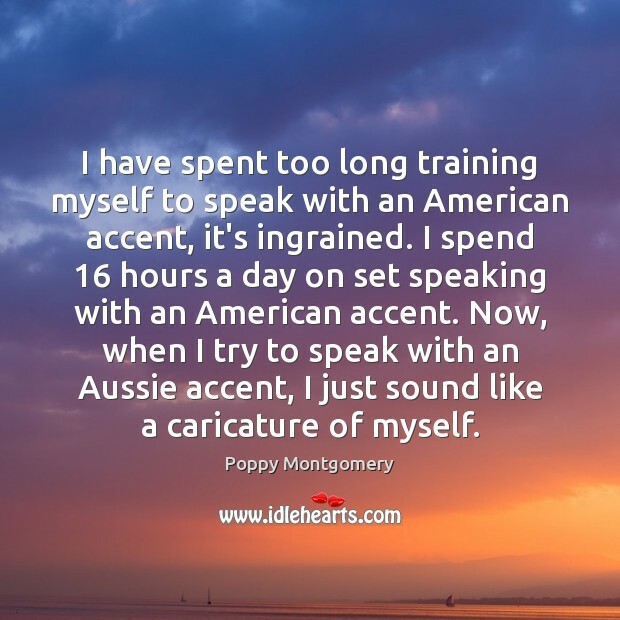 Now, when I try to speak with an Aussie accent, I just sound like a caricature of myself. 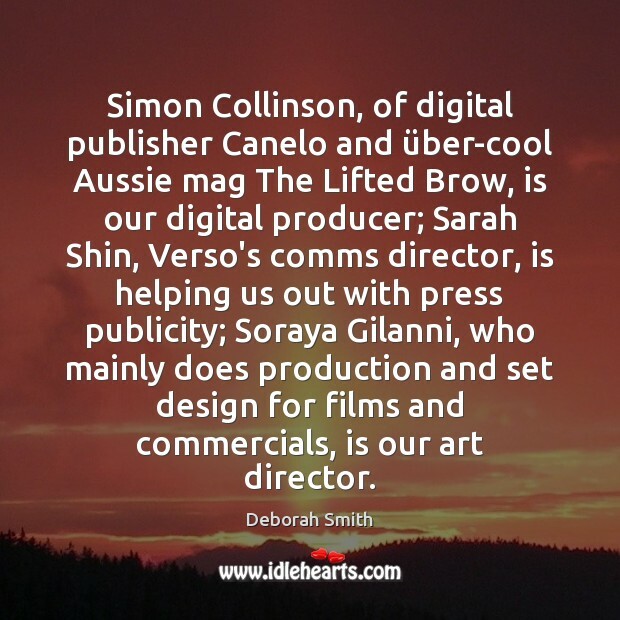 Simon Collinson, of digital publisher Canelo and über-cool Aussie mag The Lifted Brow, is our digital producer; Sarah Shin, Verso's comms director, is helping us out with press publicity; Soraya Gilanni, who mainly does production and set design for films and commercials, is our art director. 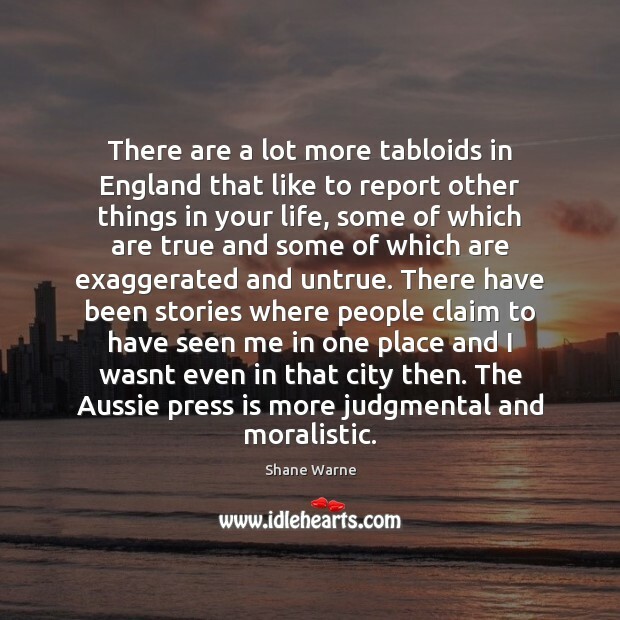 There are a lot more tabloids in England that like to report other things in your life, some of which are true and some of which are exaggerated and untrue. There have been stories where people claim to have seen me in one place and I wasnt even in that city then. The Aussie press is more judgmental and moralistic. 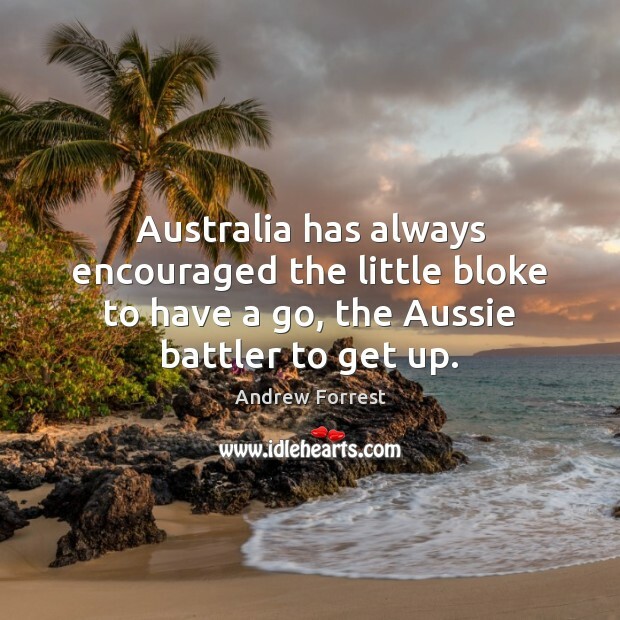 Australia has always encouraged the little bloke to have a go, the Aussie battler to get up. Sometimes when Australians go overseas, it's as though the 'Aussie' is refined out of them. I don't know why. It's never happened to me, because I'm really proud of it. 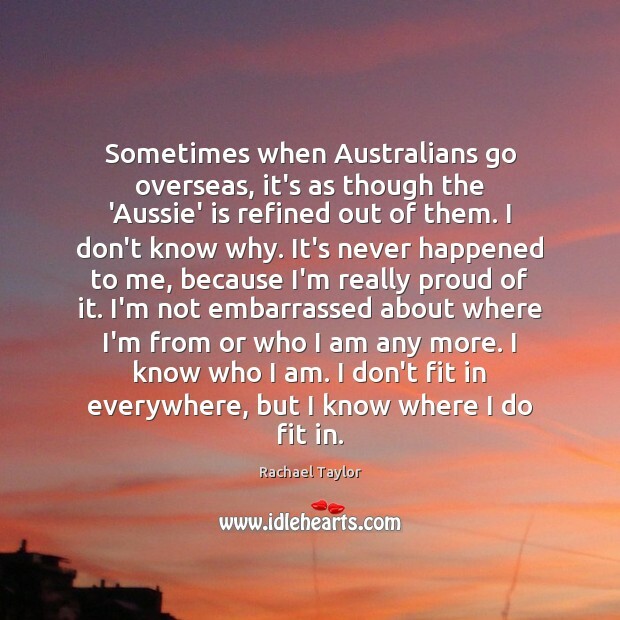 I'm not embarrassed about where I'm from or who I am any more. I know who I am. I don't fit in everywhere, but I know where I do fit in. 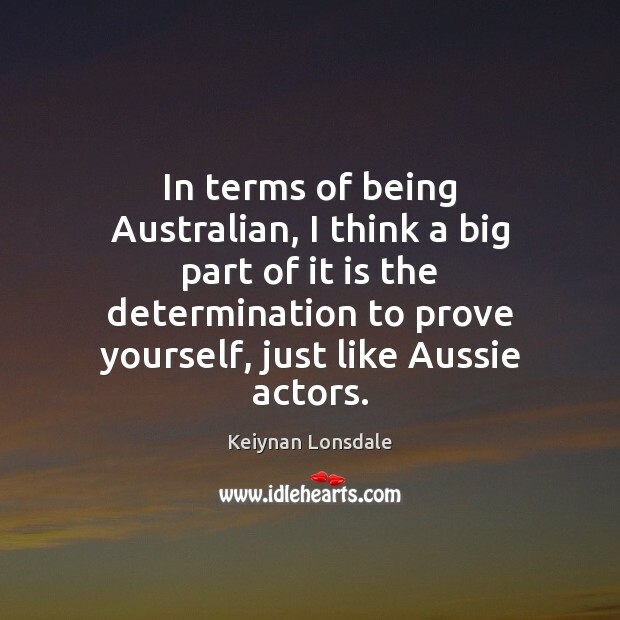 In terms of being Australian, I think a big part of it is the determination to prove yourself, just like Aussie actors. 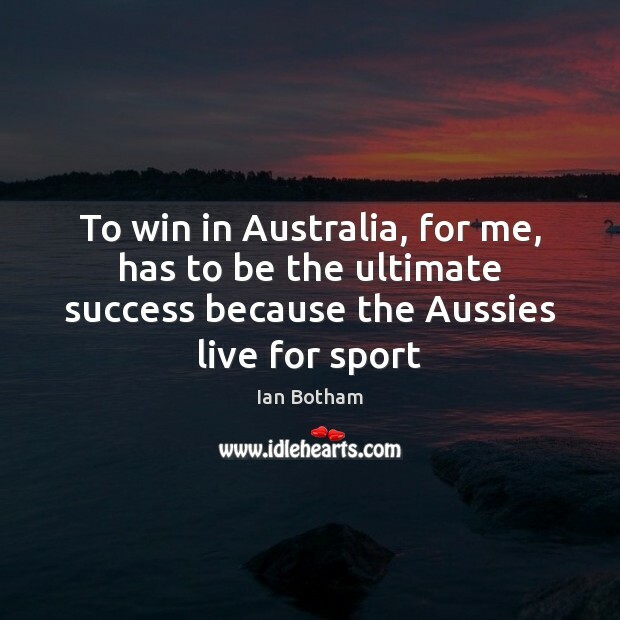 I think Aussies try to stay humble. 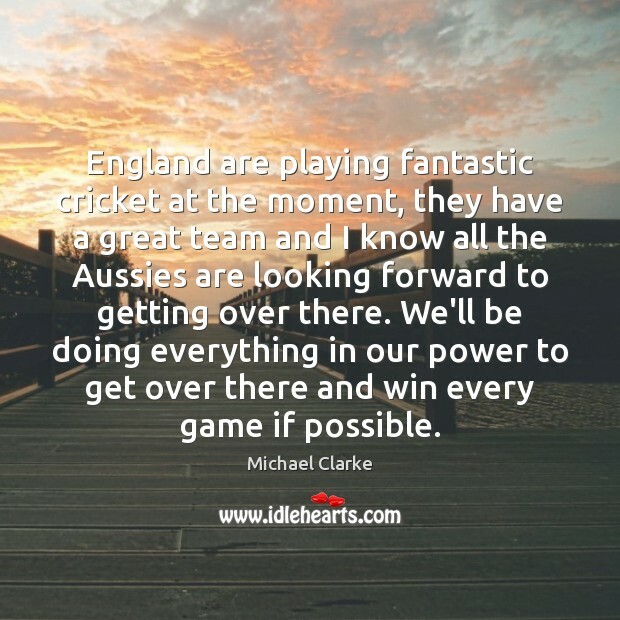 England are playing fantastic cricket at the moment, they have a great team and I know all the Aussies are looking forward to getting over there. We'll be doing everything in our power to get over there and win every game if possible. 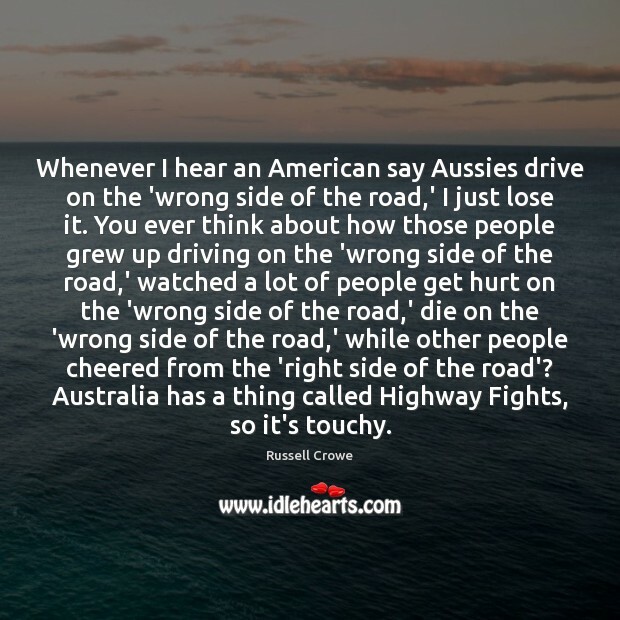 Whenever I hear an American say Aussies drive on the 'wrong side of the road,' I just lose it. You ever think about how those people grew up driving on the 'wrong side of the road,' watched a lot of people get hurt on the 'wrong side of the road,' die on the 'wrong side of the road,' while other people cheered from the 'right side of the road'? Australia has a thing called Highway Fights, so it's touchy. 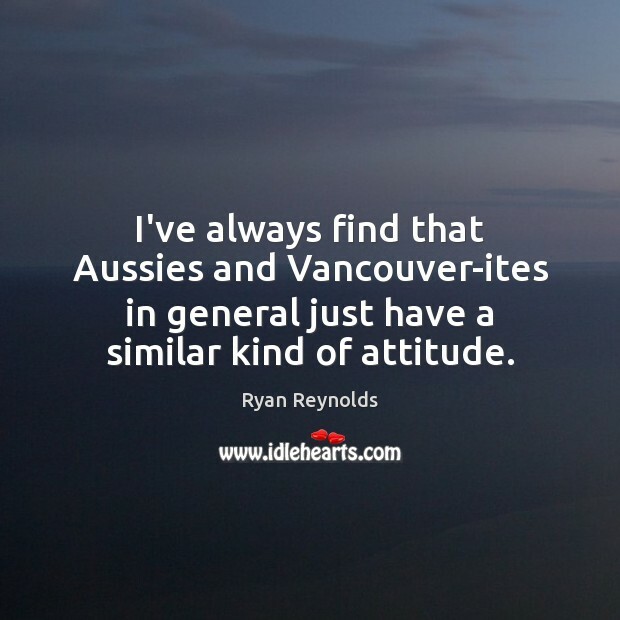 I've always find that Aussies and Vancouver-ites in general just have a similar kind of attitude. It's an interesting thing in this country. I haven't won a gold medal, yet Australians still take me into their houses and hearts, they know my name and they care. 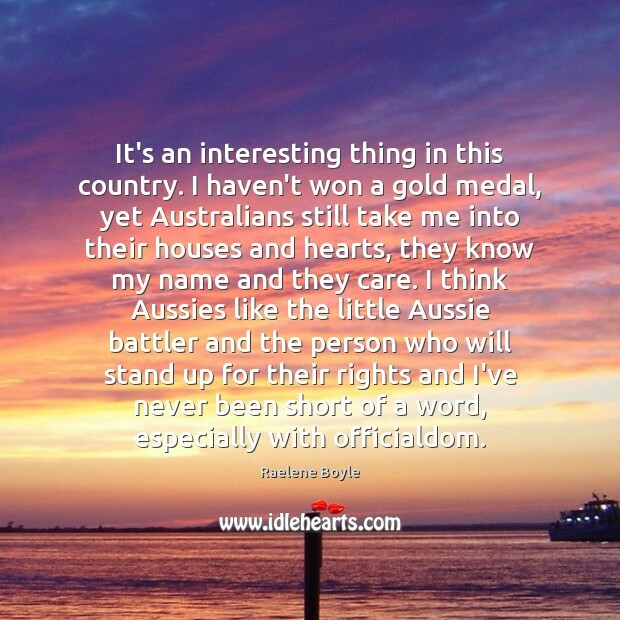 I think Aussies like the little Aussie battler and the person who will stand up for their rights and I've never been short of a word, especially with officialdom. Don't you stupid Aussies get it? 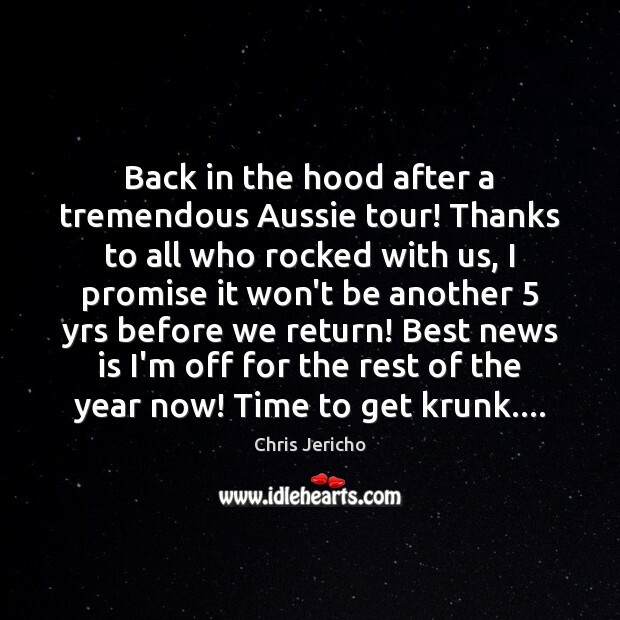 Australia is doomed! Nothing, and nobody, can help you. 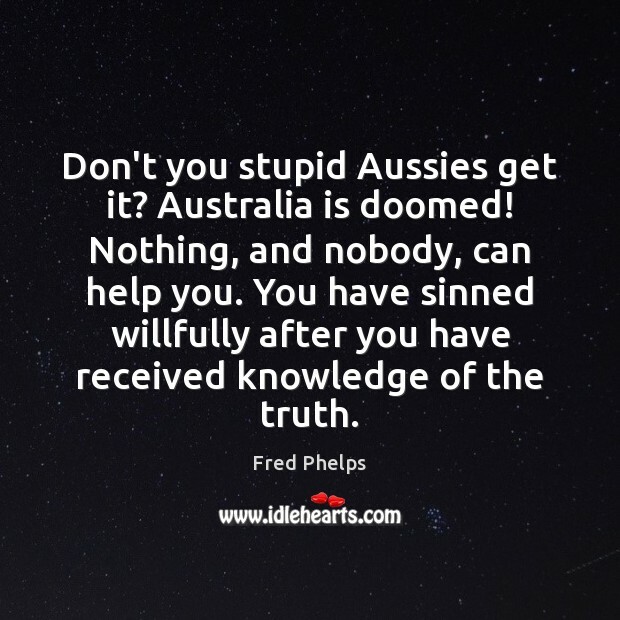 You have sinned willfully after you have received knowledge of the truth. 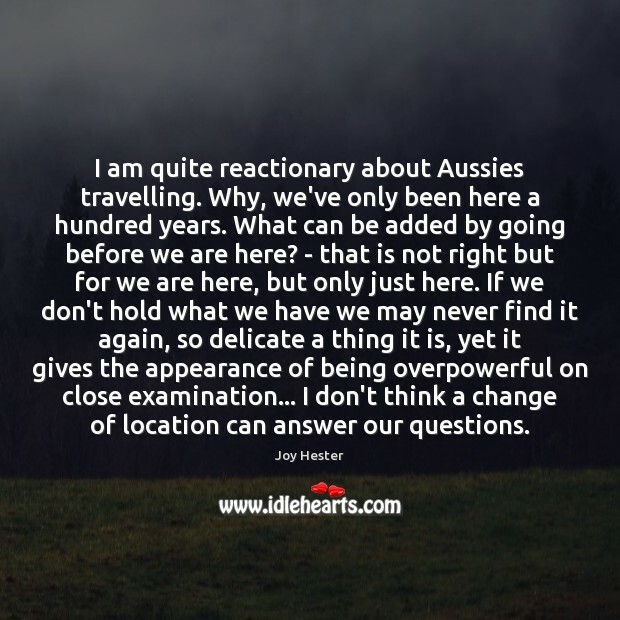 I am quite reactionary about Aussies travelling. Why, we've only been here a hundred years. What can be added by going before we are here? - that is not right but for we are here, but only just here. If we don't hold what we have we may never find it again, so delicate a thing it is, yet it gives the appearance of being overpowerful on close examination... I don't think a change of location can answer our questions.